And there it is. 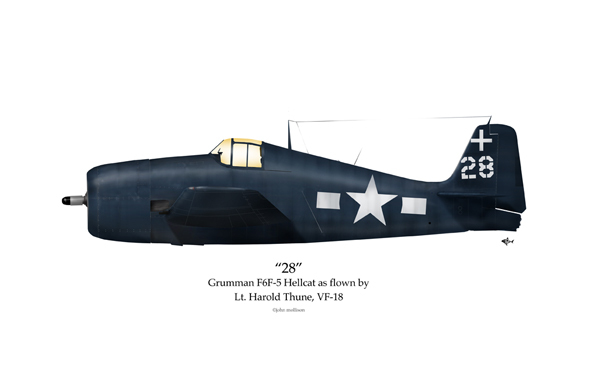 "28" - a workaday F6F-5 as flown by Lt. Harold Thune of the USS Intrepid, circa Fall, 1944. Yesterday morning, Harold signed prints of my hack, passing them down the table to his son, a US Senator, where he too penciled his name. But the star of this moment was not Senator John Thune. Nor was it me. Nor was it Harold. It was the camera man from the local TV station who had shown up to document the event. For whatever it's worth, I dedicate this print of Harold's Hellcat to...him. If you were there, you would have seen what you'd have expected from the office of a US Senator - polished people of profession and poise - laughing at the right places, shaking hands with appropriate grip and confidence. It was all authentic, but still tinged with the superficialities that come from position and power. Then the TV guy showed up. One man, carrying two heavy tripods, a camera and a day full of other stops to make. He set up, turned on the camera and documented every moment of my self-importance and Harold's self-effacing recollection of his part in history. ...and the camera guy said "Thank you. For winning." Sweet jimminy, his words stopped me cold. 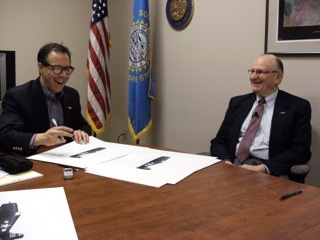 If I'd been a little less star-struck by having a US Senator and his WW2 Fighter Pilot father signing my paltry art, I would have turned the camera on him. See...about twenty minutes before, Harold began describing an aerial victory. His hands pantomiming the dogfight - the Japanese fighter speeding under Harold's stall-climb and the split-second push of the control stick that dropped the Hellcat's nose, bringing 6 .50 cal machine guns to bear with predictable result. Machine aflame, the enemy pilot climbed out onto the wing and prepared to leap clear of certain doom. Harold had a choice to make and you know what that choice was. If anything comes from my time with these old guys it will be this - that the study of human History is a mystery. I have a more satisfying time wondering what color dinosaurs were than reconciling human behavior. Harold said the oft-quoted line, "War is hell." But he said it with the choke and gulp of someone who's earned the right to say it. Hollywood can script it, but Harold knows. As a History teacher himself, Harold knows full well the in-congruencies of things like American Freedom and the expansion that ruined Native America. Of Western empire building versus Japanese empire building. Of two guys who happened to be fighter pilots, one flying a plane with a white star on its wing, the other a red circle. Nope. Harold did not fire. The Japanese pilot tumbled away, snatched from momentary death by the snap of a parachute while his defeated machine arced to its doom, trailing smoke and fire. Every day, I become more of a Patriot. I'm in awe of the American Constitution, Bill of Rights and Declaration of Independence. And every day, I become more convinced that the soul is far sharper than the sword. I too am thankful that Harold "won." *Harold never used the term. In fact, I've never heard an American WW2 pilot call the Japanese "yellow bastards." I think the line was used more in propaganda films than anywhere else, save for hand-to-hand combat and anyone who survives that can say anything he/she wants. If you find this stuff half as fun as I do, we're all having a ball. Done! Sort of. I'm not happy with the wing and I might redo it. But for now, I'm content to put "1" up for readers to see/read about this machine and the man that flew her. In case you're new to all-things-OS2U, the Chance Vought "Kingfisher" was a seaplane charged with the job of "Observation" hence the "O." The particular airplane above, BuNo (Serial Number) 01487 flew from the battleship USS South Dakota. Launched from a gun-powder charged catapult, this little machine buzzed above, serving as the Fleet's aerial eye, helping target the 'big guns' and spotting enemy submarines. But, what I think is especially cool about this airplane is its additional role in recovering lost pilots. I can vividly imagine the sensation of being adrift in the ocean, rising and falling with the swells of gray, working at keeping alive in an utterly unhuman environment. Having been scared senseless by the movie Jaws, the Unknown swimming beneath my paddling feet adds to a feeling of helplessness. Ok, terror. Until...the blat of an airplane engine, bouncing across the water's surface provides the heart-leaping word that becomes everything in moments of hopelessness - Rescue. I then think about Ted, alighting on the waves in a spray of salt water, motoring to the dirty yellow speck of life raft, or inflatable vest and cutting the engine, letting inertia, wind and wave push him to the once-lost man. Rescue! 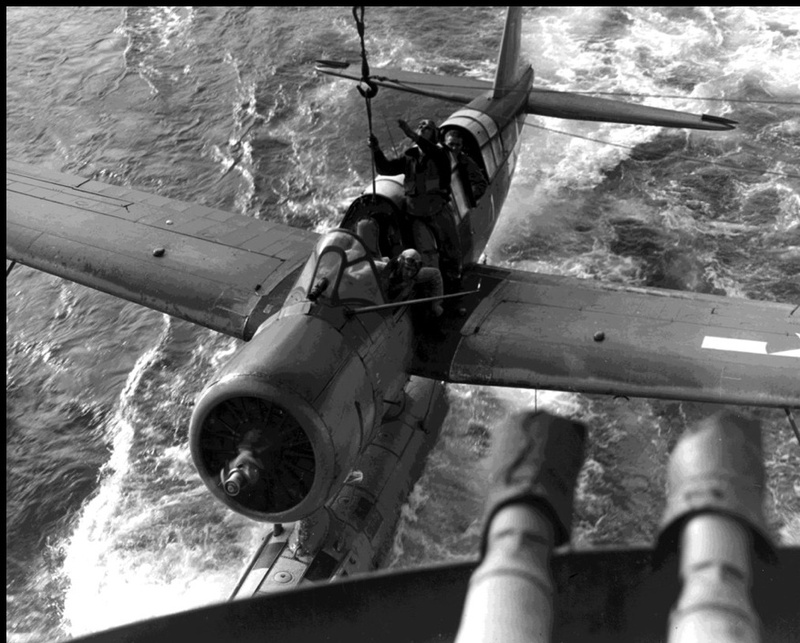 On one such mission, Ted had to step out onto the airplane's wing and haul up a pilot who had barely energy to stay afloat, let alone climb up into the rear cockpit. Can you imagine how rewarding such work must have been?! To be the heart, hands and face of one who saves another?! An emergency room doc told me, "(my work) doesn't get any more 'real.' It's the human experience in its most urgent." I bet Ted felt the same way. In fact, in a few days, I'll be interviewing Ted formally - and I'll ask him just that. Of course, I'll let you know what he says on my website. 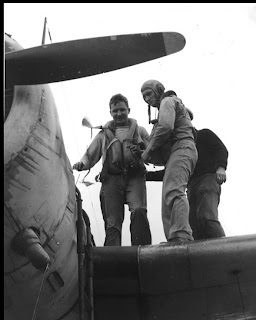 But in the meantime, I hope this airplane...and the photos below inspire you to think about those people who play the role of Rescuer in modern life. Special thank you to Tom Fallon and Rick Lingberg for providing me the opportunity to document this airplane and her very cool pilot. Also, do yourself a favor and visit the website of the USS South Dakota. Rick Lingberg and his team have worked hard to create a satisfying digital monument to the most decorated capital ship in American history. NOTE: Airplane geeks will notice the gray rudder and think, "Hey! That's not a standard paint job!" 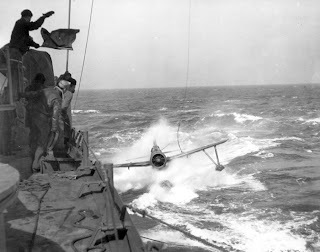 Well, the USS South Dakota went through two Pacific storms in December of 1944, damaging the exposed airplanes. The Kingfishers were repaired at the depot on the island of Ulithi using standard, primer-painted spare parts. 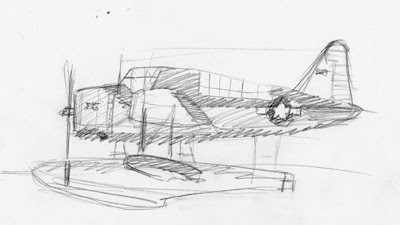 This illustration shows Ted's airplane in between repair and the point in time where the ship's maintenance crew found time to bring the airplane up to standard. Two airplanes at once is proving to be difficult and I don't quite like it. I enjoy the feeling of focusing on one airplane - after finishing Rostrom's B-17 and Ted's Kingfisher, it's back to one-at-a-time. 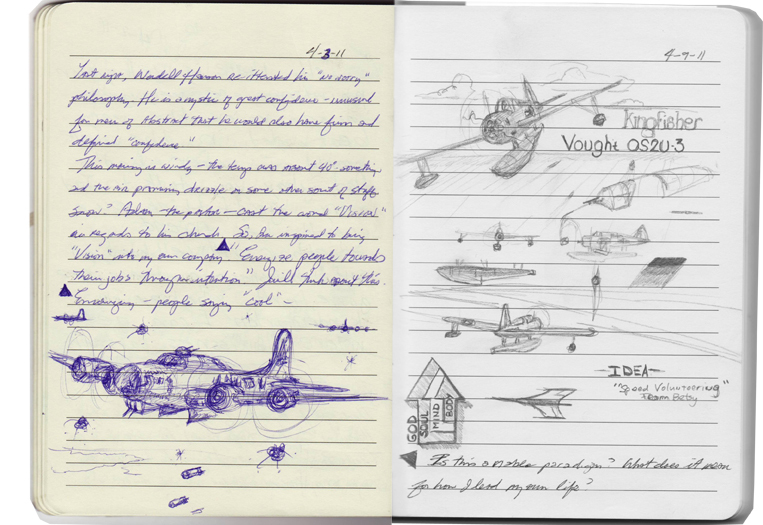 However, a loyal reader has asked to see more of my sketchwork, so I'm attaching two pages from my journal - one from April 3 while I was at church, the other done yesterday while at one of those "all day" business training/management events. 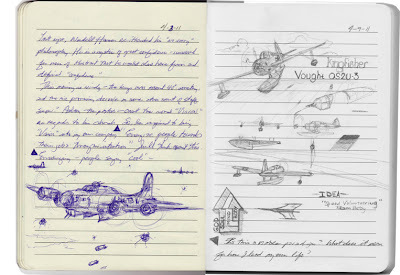 So, here you go, Reader from Phoenix, Arizona - a "ballpoint pen" of Satan's Chille'n releasing her payload over a Nazi-held target and a pencil study of an OS2U-3 Kingfisher and some random notes that have nothing to do with the seminar. And to another reader who is interested in Rostrom's B-17, it's below - the wing has yet to be masked in, the turrets are barely started and I haven't begun the Plexiglas at all. I give it 60% finished. "1" - Hutchin's Kingfisher - is still in sketch-phase. 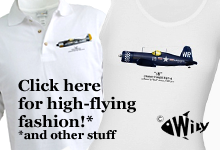 But, I do have something to share about Ted Hutchins, Kingfisher pilot. 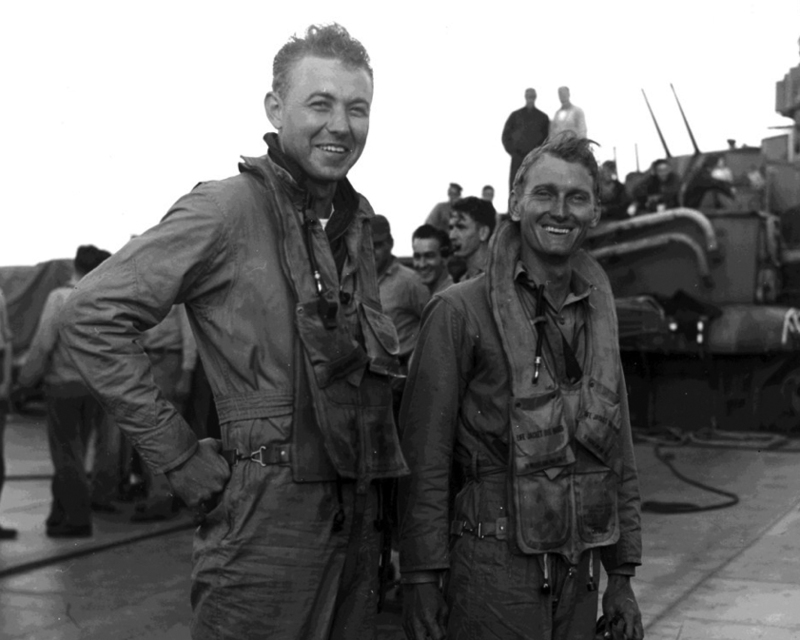 The photo below is of Ted (right) and an unknown (to date) pilot that Ted snatched* from the Pacific. Imagine what it must have been floating in the expanse of the ocean, in a waterlogged flight suit, suspended above the unknown depths by the thin rubber of a life raft. Marine ace and Medal of Honor recipient Joe Foss described the sensation to me as feeling, "very small." Judging from the smiles on the two pilot's faces, I have to think that Ted Hutchins had extremely rewarding work in WW2, don't you think? 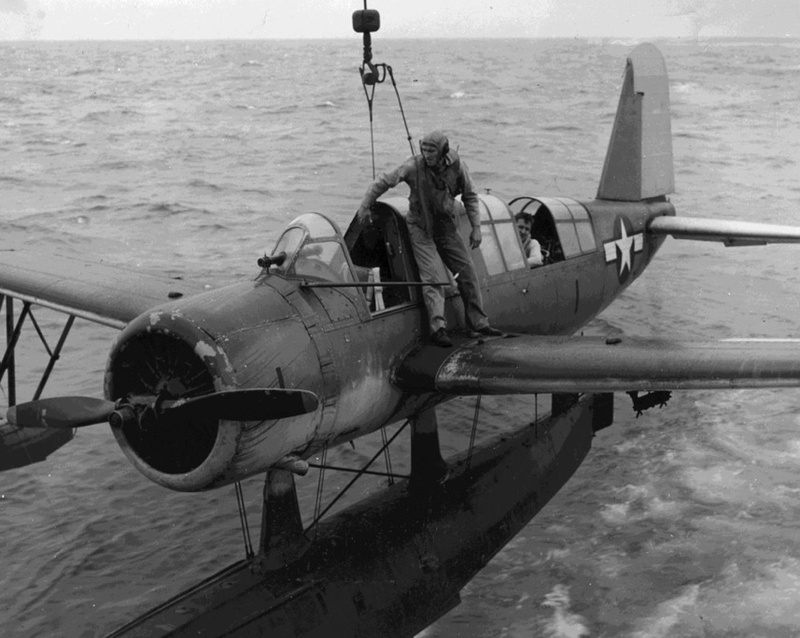 *In case you're unfamiliar, the OS2U Kingfisher that Ted flew was a "float plane" able to be catapulted from ships and also able to land/take-off from the water. Though designed to perform Observation work for the fleet, the Kingfisher was also used as a Rescue aircraft, picking up aircrew and seamen adrift in the ocean. First, would I do this for a living? I mean - real living? Damn right. Gawd, I love this part of American history and...you should too. This morning, I started out having breakfast with a medic assigned to McArthur's "return" to the Philippines circa 1944. Then, a new acquaintance let me know that a pilot assigned to the USS South Dakota (battleship) was not only alive but had sold his Harley last year. Would he like to have his plane memorialized for all digital-eternity? 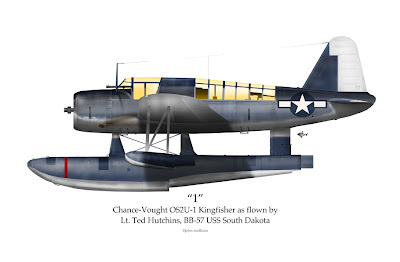 So, I guess Satan's Chille'n and Lt. Ted Hutchins' Chance Vought OS2U Kingfisher are now BOTH on the drawing board. Put the coffee pot on "full throttle." I'm not sleeping for a while. Anyway, in the words of my buddy Lt. John Forrette who served in the Philippines circa 1944-45, "History doesn't sleep." Watch this space - it's going to be awesome. PS - no kidding, as this is being typed, my kid is scratching the American anthem on his violin. It sounds awful but...is wonderful at the same time. PSS - here's my first sketch!